Donors and volunteers across the Valley gathered at the East Valley Institute of Technology to celebrate A New Leaf's 45-year anniversary. Enjoying a delicious lunch and an inspiring program, attendees were treated to videos of long-term supporters telling their personal stories about the organization's 45 year history. Volunteer Board Chair Deanna Villanueva-Saucedo called the award recipients "Heroes" and spoke of their dedication to helping victims of domestic violence and homelessness. 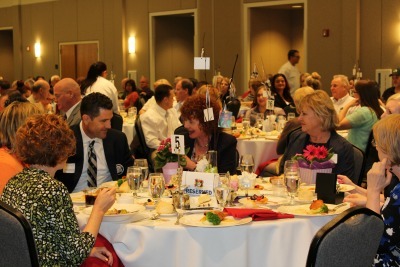 Next year's Donor and Volunteer Appreciation Luncheon is not yet scheduled, but if you are interested in attending, please call 480-464-4648. Thank you to all of the amazing donors and volunteers who are working to realize A New Leaf's mission of "Helping Families...Changing Lives."